Sometimes traditional beliefs run contrary to the facts. Most times it's beneficial to examine those beliefs and adjust to a new way of thinking. But sometimes ideas attain the status of myth for very good reasons. Here's eight of those. Human beings aren't strictly rational animals. Car enthusiasts, for all their emphasis on numbers and measurements, are roughly equal parts rational and rationalizing, and there's no end to the myths that have grown around car culture. We believe that many of those myths, while perhaps not strictly true, are beneficial and help make car culture a fun place to be. We therefore choose to live as if these myths are pure truth, and we fully support all those who do. Click Next to see some of our most cherished. MYTH: Cars were just plain better in the old days. WHAT'S WRONG WITH IT: Cars are safer, more reliable, more efficient, and perform better today than they were in any version of "the old days." WHY WE BELIEVE IT ANYWAY: Because there are different versions of "better," and one definition has to include some sort of subjective measure of soul. As many have said, the rear end on that '59 Bel Air has enough soul for a Motown collection. And we believe that almost any older car, from AMCs to old Volvos, can have more soul, charisma, personality, or what have you have you than something modern designed to do nothing more than hold four sets of golf clubs and then crash. Plus, owning an older car almost invariably means you're working on it, and working on your own car makes your car more yours as well as making you a smarter and more capable person. MYTH: Ferraris are the ultimate automobiles. WHAT'S WRONG WITH IT: The overwhelming Ferrari mystique obscures the fact that these things are overpriced, overstyled, breakdown-prone pose-mobiles. WHY WE BELIEVE IT ANYWAY: So who gives a damn? Frankly, the question of Ferrari ownership is probably never going to be one of our problems, and it's good to have someone at the epicenter of automotive lust. Even if you're not a Ferrari person, you probably have some equivalent ultra-car marque as the angel on top of your imaginary lottery-winning Christmas tree, and the same logic applies-someone has to be the ultimate, and the ideal of the ultimate will always be more important than the reality. At least this ideal comes with its own F1 team. MYTH: The Indy 500 is one of the greatest races in the world. WHAT'S WRONG WITH IT: It's been trading on its storied history as it slowly becomes a boring and expensive spec race. WHY WE BELIEVE IT ANYWAY: Because we believe there's still a chance that it could return to its innovative, anything-goes, world's-best-drivers glory days. Exactly how this may happen is unclear to us, and it won't happen by next year if ever, but we hold out hope. And it's still much more fun and interesting to watch than the other Greatest Race traditionally held on the same day, the glitzier but far more past-its-prime Grand Prix of Monaco. MYTH: Car dealers can't be trusted. WHAT'S WRONG WITH IT: With contemporary consumer protection and access to information, you can probably trust them now more than ever before. WHY WE BELIEVE IT ANYWAY: Because consumer skepticism, at least educated consumer skepticism, is a good thing, especially on major purchases. Trust must be earned, right? Now, this doesn't mean prospective car buyers should walk into dealerships and say "Prove to me you're not a crook!" because for one thing, you can't prove a negative. What it means is to do your research, don't let car lust carry you away, and always, always, always take a Jalopnik reader with you when buying a car. WHAT'S WRONG WITH IT: The Prius is a perfectly competent automobile that delivers very good fuel economy and has thousands of satisfied owners. WHY WE BELIEVE IT ANYWAY: In its quest to save precious energy resources it's created a shortage of material resources. It's hideous. For the first successful hybrid, it's remarkably uninteresting from a tech point of view-when our sister site Gizmodo featured one at their gallery and ran its 12-volt battery down showing off its flashy dashboard, we were a bit miffed to find that it couldn't jump-start itself. And seriously, we'd rather be taken out and shot out behind the storage shed than spend $28,000 on a perfectly competent automobile that delivers very good fuel economy. MYTH: LeMans is a great movie. WHAT'S WRONG WITH IT: LeMans is a collection of racing footage inside of a really terrible movie. WHY WE BELIEVE IT ANYWAY: Because that's a really, really stupendous collection of racing footage in that terrible movie. Also, the terrible movie includes Steve McQueen, which softens the blow somewhat. It really seems like making LeMans was an excuse for the director, cast, and crew to hang around the Circuit De La Sarthe with race cars for a few days, and that's something we can all understand. MYTH: Manual transmissions are better than automatic transmissions. WHAT'S WRONG WITH IT: Automatics are catching up; the dual-clutch units can outperform manual boxes in many cases, and even their fuel-economy advantage may be disappearing. sixty a bit slower than ride there. MYTH: Gaze upon my works, ye not worthy, and despair; for I am Bob motherfucking Lutz. 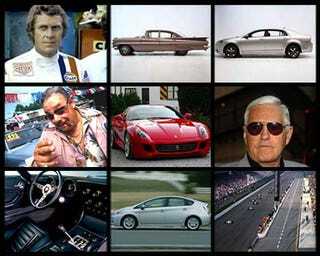 WHAT'S WRONG WITH IT: What, Bob Lutz? So-called Father of the Viper? He's just a marketing guy. WHY WE BELIEVE IT ANYWAY: Listen, we need colorful figures in this world, and Bob Lutz is the most colorful person we have in the American car business. Perhaps in any business. His is a tradition going back as far as Barnum, or at least Don King. Are auto writers worried that Fritz Henderson will land a helicopter in their backyard, walk into their house, and yell at them? Is Alan Mulally or Scott Monty going to challenge us to a duel anytime soon? Nope. And seriously, without Lutz, we wouldn't have so much of modern car culture, from the phrase "The Ultimate Driving Machine" to the aforementioned Viper. Yes, there's way too much marketing in the world today, but that's not the problem. The problem is that Lutz isn't doing all of it.